What to Do After a Car Accident | South Carolina Personal Injury Attorneys | Criminal Defense Lawyers - Strom Law Firm, L.L.C. Unfortunately, accidents happen all the time. But your Your personal injury case is about more than the accident itself. If you were involved in a car accident, the South Carolina Department of Motor Vehicles (DMV) says the first thing you need to do call law enforcement, unless there was minimal damage. If the police were not called and the wreck caused more than $1,000 in damage or resulted in injury or death, the DMV requires all drivers to submit a Traffic Collision Report. Your insurance company must also complete a portion to verify the coverage on your vehicle. If you or a loved one does not properly submit a collision report, you might be subject to legal penalties for driving without insurance. Making sure that you take the appropriate steps initially can help you later, especially if you go to court for personal injury or criminal charges. Document the Accident Scene – Take pictures of the damage at the scene: If you are safely able, make notes and take pictures of all of the important details of the scene. If anything is damaged in your car such as a computer, cell phone, etc, make sure you document the damage. Obtain the Other Driver’s Information – Secure contact information, including name, address, phone number and car insurance coverage for the other driver. Identify and secure contact information for any witnesses; note the make, model, color of the other car or cars involved. Be Careful With Your Statements – Do not volunteer any information regarding who is at fault. Saying that you are sorry or admitting that you were distracted may be used against you later as an admission of fault. Do Not Talk to the Insurance Adjuster – While you may be required to issue a statement at some point during the claims process, don’t talk to the adjuster until you have had the opportunity to speak with one of our Accident Injury Attorneys. It is also about what happened after the car accident or injury. It’s about how that accident and those injuries have affected you and your life, and about how they may keep on affecting you in the foreseeable future. 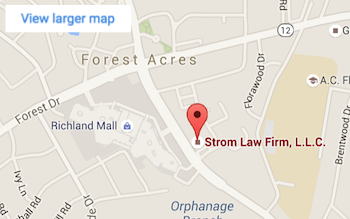 The car accident attorneys and support staff at the Strom Law Firm, L.L.C. have experience dealing with incidents and can help ensure you receive fair compensation for all your injuries; current and future. Even those cases which do not involve life altering injuries or complex legal questions are often defended aggressively by insurance companies. The insurance companies who most often defend at-fault drivers spend millions of dollars teaching their adjusters how to successfully deny claims.